Kuching is full of surprises waiting to be discovered. One case in point is Jangkar Waterfall. Jangkar Waterfall is off Kampung Jantan, which is along the road to Kampung Biawak. If you are going from Kuching - take the bypass after you reach Lundu and go towards Sematan Beach. The Jangkar Waterfall is located on the slopes of the Berumput range on the boundary between Sarawak and Indonesia, the waterfall is the largest in southern Sarawak. However, due to logging and plantation activities since the 90s, the villagers there are worried that their natural source of water and the beautiful waterfalls would disappear like the one in their neighbouring village. �We stopped the loggers who attempted to log into our area outside their given boundary. Now, there is no more illegal logging near our place. 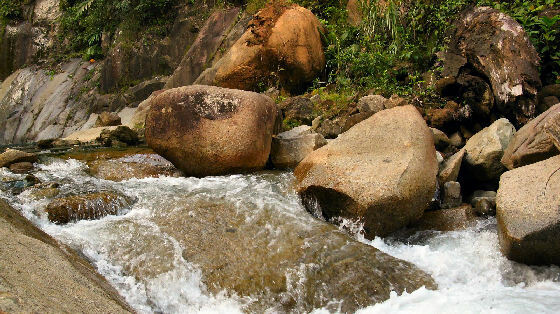 We hope the waterfalls can be preserved for future generations,� said Benjamin Sulaiman, who hails from Sibu and has been staying at the village after marrying a local woman in 2000. Benjamin, a tour guide, met his wife when he came to work at a nearby plantation in the 90s. They have three children from six to 10 years old. His career as a tour guide began few years ago after tourists came to the kampung asking for directions to a seven-storey-high waterfall. He was previously a contractor transporting oil palm and delivering parcels across the border to Indonesia. Since then, he has been a busy tour guide, especially during weekends when more visitors arrived. His brother-in-law, Kapit, 32, later joined him as a full-time guide. Kapit�s house is located in the middle of the kampung. He has stopped going to his farm and stays at home most of the time, expecting visitors who turn up at any time. After visiting many similar sites in Sabah, Benjamin became confident that the Jangkar waterfall could be developed into an ecotourism site. 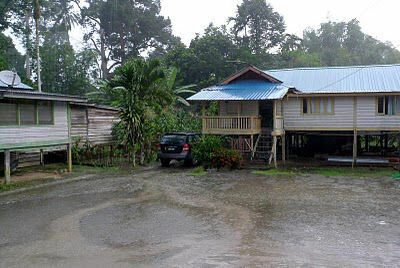 His efforts to bring visitors to the kampung, however, was not supported by some villagers. "I tried to change their mindset. Our people can all benefit from tourism. With the increase of tourists, we can ask the state to help us build better infrastructure,� Benjamin told StarMetro when leading a group of Kuching City Hash (KCH) members to the waterfall recently. 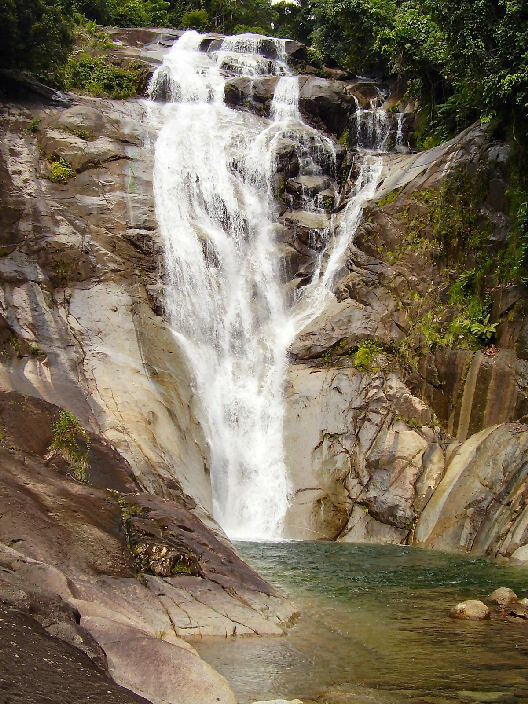 The waterfall, called by some as Jantan or Sinar Harapan, was chosen as the location for KCH�s weekly Saturday run last week. The �hare� (trail organiser) and co-hares were present at the waterfall in the morning to set the trails by placing white paper markers along the way. The hashers followed the markers to the destination during the run which started at 4pm. Benjamin led a group of co-hares in making a short trail while Kapit led another group in making a long trail. The short trail took about an hour to walk while the long trail was double the distance, but both trails led to the Jangkar waterfall. The group walked through a rubber estate path for about 30 minutes followed by a 20-minute uphill climb before reaching a river. The trek took longer than expected as the organisers carried loads of food and drinks in a wheelbarrow. After a further walk up-river over a few big rocks, the group was welcomed by the roaring waterfall as its magnificent cascade came into view. This breathtaking sight with the water gushing down was exhilarating, and the incredible natural fauna and flora in the area gave it a truly wonderful ambience. Benjamin believed that more visitors would create awareness on conservation of this beautiful place. On the fees collected, he said part of it went to the village, those who helped and those whose housing areas were used as car parks. The run�s hare, Ng Pet Onn, 54, who joined KCH in 2001, said the waterfall trip was a �virgin trail� for the group. There were many beautiful places in Borneo and the group was always trying to discover new natural sites, he added. The run to Jangkar waterfall was KCH�s 1,123rd. �Members who were here for the first time were amazed by the natural beauty of the place. It is like heaven,� said Ng, adding that many KCH members were planning another trip to the waterfall, a hidden paradise of Borneo.